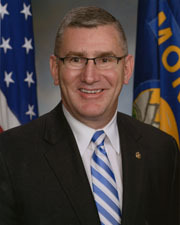 WALSH, John E., a Senator from Montana; born November 3, 1960, in Butte, Mont. ; graduated Butte High School, 1979; attended Carroll College, Helena, Mont. ; B.S., University of the State of New York, 1990; served in the Montana National Guard 1979-2012, obtaining the rank of brigadier general and earning the Bronze Star and Combat Infantryman’s badge; lieutenant governor of Montana 2013-2014; appointed as a Democrat to the United States Senate on February 9, 2014, to fill the vacancy caused by the resignation of Max Baucus; took the oath of office on February 11, 2014, and served from February 9, 2014, to January 3, 2015; did not seek election in 2014.